Prayers can limit the secondary disaster. To everyone in the world, let us offer a prayer of love to the Indian Ocean rim countries! Just today, WHO has released a warning for the possible emergence of epidemics. It has reported that at the moment, the hygiene has dramatically worsened, and the epidemic such as cholera could spur in any minute. If so, as many people could die from infectious diseases as were killed by the tsunami. I feel terribly sorry for the loss that has been caused by the biggest catastrophe of tsunami in history. I am utterly lost for words to offer for the deceased and their family. I just pray to god that their souls shall rest in peace. As a Hado (vibration) researcher, I am truly worried about this disaster. As well as the hygiene issue, I feel that the “vibrational fields” of the countries have extremely deteriorated. The “field” is created by feelings of fear, grief, worry, lack of trust, anger, loneliness, and helplessness, and could energize the malevolent microorganisms that prefer this kind of environment. 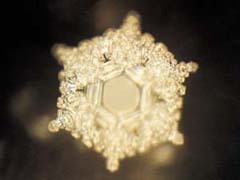 A water crystal of water that was exposed to the words: "Love and Thanks"
People cannot help but have these feelings, and they probably carry the feelings with them. Many people feel this way, and there seems to be some plundering going on, but their feeling of anger and hostility can only multiply the negativity of the “field”. Also, we must take into account the emergence of a new epidemic. We have to limit the negative field in any way possible. I believe that there is already a spreading Hado (vibration) of fear due to the terrorist attack and bombing, and it is like a gasoline station with an oil leak that is about to explode. What can we do? The only way is for people from all over the world to pray for the recovery of the affected area. The prayer will definitely carry far with the purity of its Hado. Therefore, from today, let’s close our eyes for a few second before our meal and send words of prayer to the countries. Let’s send a prayer for them before we go to sleep. Also, when we pray during the end of year and the new year ceremony, let us send a prayer first and foremost for world peace.